Since there are so many factors that can influence whether a stay on a vacation is pleasurable, a good value, the condition of the accommodations, the staff, the ambiance, the guests and one’s own expectations, I provide an assortment of places to help narrow your choice before checking reviews on Palau’s lodging choices. I broke Palau’s hotels and motels down into different categories based on their offerings and price. I have reviewed the Palau Pacific Resort for those looking for one of the best resorts on Palau. Click here. Set on a private white sand beach, this hotel is in Airai, within the vicinity of Asahi Stadium and National Stadium. Regional attractions also include Rock Islands and Capitol Building. Bungalow style resort is situated on a hilltop in the middle of Arakabesang Island. Features seven bungalows with their own balcony with spectacular views and private beach access. Located in Palau’s Rock Islands, Carp Island Resort is covered with lush forest and located only minutes away from the most famous dive sites. The Palau Pacific Resort is a luxury resort sitting on 64 acres of lush tropical gardens, incredible ocean views, great amenities and decorated in an island motif. Palau Plantation Resort sits on a hillside within a tropical jungle offering traditional-styled cabins, cottages, and villas. Situated on its own private beach, Palau Royal offers ocean views from every room with full amenities of one would expect from a resort. Papago International Resort Palau is situated in the middle of Koror. The hotel is designed as an eco-friendly facility with a restaurant and other onsite entertainment activities. Located on a lagoon close to Sam’s Tours, the Sea Passion Hotel offers very nice accommodations with a friendly staff. 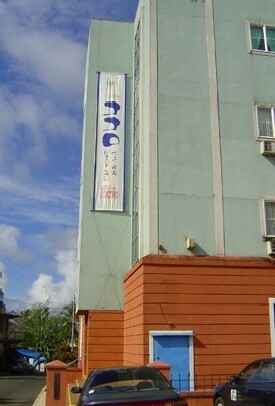 Cocoro Hotel, in Koror, is a frequent stop for Japanese tourists. The hotel has an onsite bar and restaurant for the budget minded. Located on Koror’s Southwest corner, the hotel is dockside in a lagoon. Most of the Landmark Marina’s rooms offer scenic views. The Landmark also offers an upscale restaurant with panoramic views. Palau Marina Hotel offers simple accommodations at reasonable prices for those more concerned about diving than expensive amenities. The hotel has the Southern Cross Restaurant. Located in the heart of Palau’s business district, the Palasia Hotel offers mid-scale accommodations. The Penthouse Hotel is within walking distance of many restaurants, shopping and markets in Central Koror. The VIP Guest Hotel is located in the heart of Koror and its business district. Reasonably priced hotel with satisfactory accommodations. Located on Koror’s northern part of the island, the Waterfront Villa offers apartment and “style” rooms with kitchens. The Waterfront also caters to many longer term stays. Renovated in 2013, the DW Motel offers nice accommodations for the budget conscious. DW has a shared kitchen and is 10 minute walk to shopping and restaurants. The Guest Lodge Motel is for the budget minded. Rooms are clean. King’s Motel is an economy motel. Inexpensive accommodations at Lehn’s Motel. 5 minute walk into town. New Koror Hotel is a budget conscious hotel in the heart of the city. Click here for Where is Palau.